Carl Gustav Jung (1875-1961) was one of the great pioneers of analytical psychology and the field now known as adult development theory. His ideas probe beyond the rational description of human problems and behavior to the inner focus and meaning of our lives. Jung's contributions to psychology include the concepts of introversion and extraversion, synchronicity, archetype, anima/animus and the collective unconscious. He coined the term “individuation” for the inner process which propels each of us towards greater wholeness. Jung reminded us that our own wholeness and the healing of the world soul, the anima mundi, are dependent upon each one of us developing a more conscious relationship with those unexplored or rejected parts of ourselves which lie hidden in the unconscious and which Jung termed the shadow. He learned that by honestly facing personal conflicts on the most everyday level, we each confront the deepest spiritual problems of universal human concern. When so many devoted their genius to creating the means to destroy the world, Jung went inward on a lonely and dangerous journey, discovering those creative synthesizing forces within the human psyche that might enable the world to survive. Carl G. Jung was born in Switzerland on July 26, 1875. His father was a pastor in the Swiss Reformed Church and his mother came from a family of clergy. From the time of his early youth, Jung was captivated by his dreams and inner life. This led him to embark on a journey of self-discovery, in which he questioned the beliefs of the protestant tradition in which he had been raised. He was gifted with an uncannily sharp and inquisitive intellect. Even at a young age, he was concerned with the nature of the human psyche; he read extensively from the works of Goethe, Kant, Schopenhauer, and Meister Eckhart. Though he was interested in religion, philosophy, and archaeology, he chose to pursue a degree in medicine. 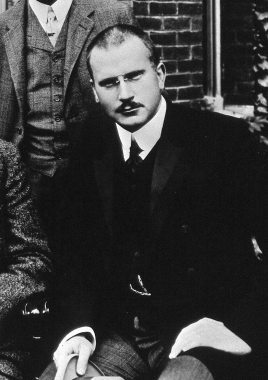 Upon his graduation from the University of Basel, Jung decided to specialize in psychiatry. He accepted a position at the Burgholzli Hospital in Zurich, a center renowned for the treatment of schizophrenia, and where psychological research, hypnosis, and other early forms of psychotherapeutic treatment were encouraged. At that time, there was an emphasis on the introduction of scientific methods in the hopes of revolutionizing the understanding and effectiveness of psychiatric treatment. Jung had found the ideal home to begin his life's work. Jung married Emma Rauschenbach in 1902, and that year he went to Paris to study with the leading French psychologist, Pierre Janet, whose ideas had a major impact on Jung. Upon his return, he collaborated with Franz Riklin on the word association experiment. This resulted in the discovery of what he termed “feeling-toned complexes”. He applied this discovery to his study of schizophrenia to show that delusions had symbolic meaning. This study laid the foundation for his concept of the collective unconscious. Jung recognized that there were mythological elements unknown to the patients that appeared in their fantasies. Through word association, the patient reveals deep-seated, hidden complexes or negative patterns of behavior that erupt out of the unconscious. While these complexes have personal relevance, they are derived from archetypal patterns, such as those expressed in age-old myths and fairy tales. In 1906, Jung began a correspondence with Sigmund Freud which blossomed into a friendship. Though they came from different intellectual backgrounds and were almost a generation apart, they shared an interest in grounding psychology in an in-depth exploration of the individual's life. They also emphasized the role of the unconscious in the individual's relationship to the inner and outer worlds. Freud termed this approach psychoanalysis. When Jung embarked on an independent direction from Freud, he called his approach analytical psychology. Jung left the Burgholzli Hospital in 1909 to devote himself to his private practice and to the study of collective expressions of the unconscious, such as mythology, folklore, and religion. He compared these products of the collective unconscious and subjected them to analytic understanding, a process he later named comparative method amplification. Amplification is a means of enlarging the understanding of an image from a dream or fantasy through comparison to such cultural material in order to glean its meaning. His first ambitious amplification was Transformations and Symbols of the Libido, originally published in 1912, later revised and renamed Symbols of Transformation. The decision to publish this now-classic work was a painful one for Jung. It effectively destroyed his relationship with Freud because it clearly demonstrated their differing views of the nature and role of the unconscious, complexes, and libido. The break was finalized in 1914 when Jung's Zurich Psychoanalytic Association ceded from the International Psychoanalytic Association and formed the Association of Analytical Psychology. During this time period, Jung also wrote Psychological Types, which was in part an attempt to understand the different psychological attitudes of Freud, Adler, and himself. Despite the formation of his own association, the break with Freud left Jung isolated, both professionally and personally. It precipitated his great turning-inward, which he called his “confrontation with the unconscious”. During this time, he explored the depths of his own psyche in order to find himself and to discover his own myth. This discovery was a counterbalance for him to the mythless, secular, modern world. During these explorations, he developed a method called “active imagination”. In this process, one encounters the living reality of the non-ego through dialogue and other forms of imaginative engagement. This means of self-investigation would become the centerpiece of Jung's approach to the psyche. During this difficult period of his life, Jung recorded his dialogues along with his illustrations in what later became The Red Book. He went on to elaborate his thinking in his many other books and articles, some of which are published in The Collected Works of C.G. Jung. After a long lifetime dedicated to understanding and healing the human psyche, Jung died on June 6, 1961, in Switzerland. His dreams at the end of his life expressed grave concern for the well-being of the world, and confirmed the achievement of the personal wholeness to which he was devoted. Please consider supporting our worthwhile work by joining our email list, following us on Facebook or Linked In, attending one of our upcoming events, becoming a member, volunteering your time, and/or making a donation. Thank you.